I am passionate about facilitating multi-stakeholder workshops for environmental decision-making. I have extensive facilitation, communication and collaboration skills to assist with planning and running workshops. Please contact me if you have an idea for a workshop and require an expert facilitator. Blue Carbon Solutions Workshop, Deakin University, April 2015. Facilitated by Prue Addison, and featuring Wayne Wescott (GreenFleet) and Paul Carnell (Deakin University) contributing to a group brainstorming exercise. Bridging the gap between science and business practice for biodiversity indicator development, September 2018. The IUCN and University of Oxford hosted a workshop in Oxford to convene a small group of conservation and environmental scientists to help communicate the science behind indicator development to the private sector. This workshop was part of the first phase of the IUCN and Oxford University project designed to provide guidance for businesses on how to identify or develop robust and relevant biodiversity indicators for different business applications. This workshop brought together 12 scientists to discuss the wealth of academic research and practice that has been undertaken over many decades, and translate the science, tools and tips in order to support businesses in their development and use of biodiversity indicators. The aim of this workshop was to develop a proof of concept: that the wealth of academic research and practice on biodiversity indicator development is directly relevant to businesses who are seeking to identify or develop biodiversity indicators. The report from this workshop is available here: IUCN Oxford biodiversity indicators for business Workshop Report_final. Building biodiversity into corporate natural capital accounting and reporting, July 2018. The University of Oxford, with the support of the ICAEW’s Charitable Trusts and the Natural Capital Coalition, hosted a workshop on the 16th and 17th July to explore whether and how biodiversity can be integrated more comprehensively into corporate-level accounting and reporting. This workshop was facilitated by Professor Richrd Barker and I, and brought together 17 participants with technical expertise across a variety of disciplines including accounting, sustainability, auditing, environmental economics, and conservation science. This topic is a complex one, which requires an in-depth understanding of the market forces that drive corporate accounting and reporting, the current status of non-financial accounting and reporting systems, an understanding of natural capital approaches to help value the living environment, and an understanding of biodiversity measurement and management. Participants engaged in enthusiastic and lively discussions around why accounting and reporting approaches are well defined in some areas (e.g. for finance and carbon), whilst other critical aspects of the natural environment, such as biodiversity, corporate accounting and reporting approaches are yet to be fully developed. For more information see: Biodiversity and corporate accounting and reporting workshop report. Setting priorities for biodiversity action at the University of Oxford, December 2017. This workshop was run for Oxford University Estates. In 2016 the Oxford University Estates Services developed a Biodiversity Strategy 2016-2020, which outlines how it will ensure the ‘biodiversity within the functional estate is both protected and enhanced’. This workshop brought together 23 biodiversity experts, parks and college managers, and estate managers to discuss the Oxford University community’s biodiversity priorities. The purpose of this workshop was to determine an agreed upon list of biodiversity priorities for action across the Oxford University Estate. Knowledge Exchange Practice at the University of Oxford workshops, November and June 2017. These workshops were the first of their kind in Oxford. Alice Purkiss (Knowledge Transfer Partnership Associate, University of Oxford & The National Trust) and I brought together Knowledge Exchange practitioners from different departments across the University of Oxford – those who are actively running projects that focus on the transfer of research beyond academic boundaries to benefit society, policy and practice. The aim of these workshops was to provide our network of over 50 Knowledge Exchange (KE) practitioners an opportunity to network, share learnings, and define what effective practice of knowledge exchange looks like across disciplines at the University of Oxford. A Collaborative Platform for Making Change: Scaling up actions for biodiversity conservation. A workshop run in collaboration between the University of Oxford, BP International, Fauna and Flora International and the United National World Conservation Monitoring Centre. November 2016. This workshop brought together representatives from 20 business and industry associations, 10 NGOs and intergovernmental organisation, and 3 research organisations. The purpose of the workshop was to identify opportunities for collaboration between business, governments, science providers and NGOs, in support of the delivery of international biodiversity conservation priorities. A workshop report is available here. Pilot Commonwealth Marine Reserves Indicators Workshop, Parks Australia and the Australian Institute of Marine Science, November 2015. This workshop brought together researchers and natural resource managers to identify environmental indicators to monitor ecological condition of Commonwealth Marine Reserves (CMRs). Participants were asked to assess the value of information of monitoring programs to help prioritise indicator selection. Marine Strategy Framework Directive (European Union) and the Long Term Sustainability Plan (Great Barrier Reef) Workshop, Australian Institute of Marine Science, July 2015. This workshop brought together scientists and managers, to learn about the MSFD. Participants then discussed the lessons learnt from the MSFD in relation to the development of an integrated monitoring and reporting program for the Great Barrier Reef. 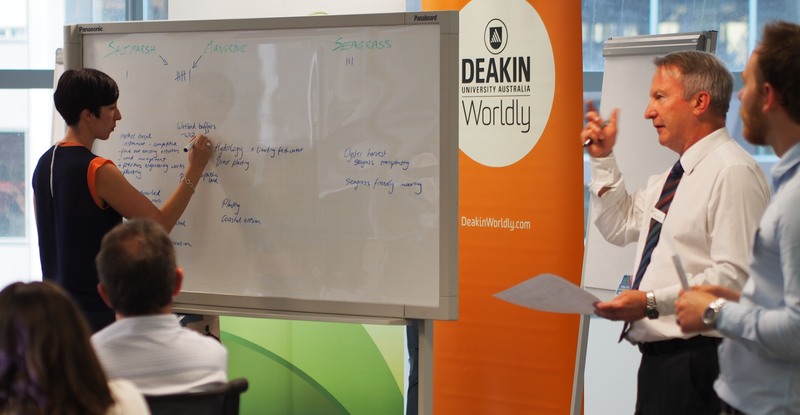 Blue Carbon Solutions Workshop, Deakin University, April 2015. This workshop brought together participants representing science, policy, and business spheres to develop on-the-ground solutions to advance Blue Carbon projects in Australia. See this blog post for more details. Reef Trust Cost-effectiveness Workshop, Australian Institute of Marine Science, December 2014. This workshop brought together a diverse group of researchers, natural resource managers and planners from the Great Barrier Reef World Heritage Area (GBRWHA). Participants were involved in a modelling exercise where they estimated the cost-effectiveness of proposed management interventions under the Reef Trust. See our workshop report for more details. Using Science to Create Defensible Decision Thresholds Workshop, NERP Environmental Decisions Hub, May 2014. This workshop brought together protected area managers from agencies across Australia and New Zealand to determine the current progress in developing and implementing decision thresholds in a protected area and land management context. The information generated during the workshop was used to develop a generalised process that can be integrated into existing systems within agencies and used to guide the development and successful implementation of decision thresholds. See our workshop article for more details. Conservation Management Thresholds Workshop, Parks Victoria, August 2013. This workshop brought together a small group of participants from Parks Victoria with experience and knowledge of Marine National Park (MNP) management, and external marine scientists with expertise in intertidal ecology. The aim of this workshop was to trial a participatory modelling technique to assist Parks Victoria in exploring management thresholds for the evaluation and adaptive management of Victoria’s MNPs. See our paper on setting management thresholds for more details.